From the And Roses garden you cross the bridge at Plum Creek and walk around Ungardening Pond which has been half filled again. Behind the waterfall, along the Woodland Walk. Pause at Rest and Be Thankful. Between the ash trees, looking at planters with some sad Clivia. Cymbidium pots in the shade. Glance at the Folie de MIIX, where my spring bulbs wait, with Eucomis and Merwillea, some bright pink Oxalis, and spotted leaf Drimiopsis. Agapanthus in large terracotta pots. Ignore the pink border and the blue and purple border. We do have Plumbago and Tulbaghia there. The path beaten while repairing the pond, is also a project for new ideas. In the shade of the ash tree is our Karoo Koppie. Then Apple Creek, some green relief on this side. 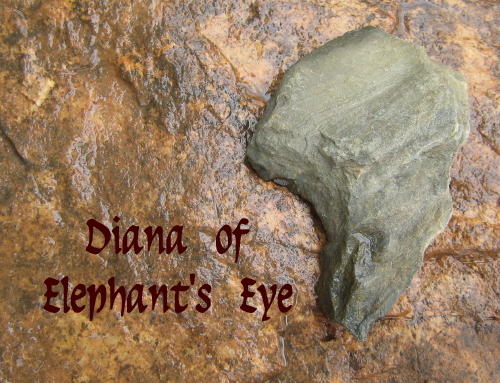 Elephant’s Eye Light Railway. Also hidden in the shade is the Mediterranean Sun Circle – which catches the sun in winter, when it is more welcome. Around to the washing lines, compost bins, the fig trees, the Swiss stacked wood for winter. Just leaving a lemon tree and some grape vines. Ending back where we started at the (invasive) giant or Spanish reeds. Those for which the French town of Cannes was once named. From this bird’s eye view, we see not how high they grow, but what a wide area they cover. Come the April walk, I hope and wish for roses, worth picking. When I look at the New Zealand bush, it is hard to believe I once picked a dozen of its blooms for my mother’s birthday!? Watching the earthquake and the tsunami in Japan, looking at the Pacific Ring of Fire, the here and now of my garden seems irrelevant. Thinking of islands, where, if you can see the tsunami coming, it is too late to run. The wall of water approaches with the speed of a Boeing. I loved the walk around your garden, courtesy the Ungardener. It helps balance the horror of what I am hearing on the news, and the pictures that my brain simultaneously shies away from and cannot forget. Those reeds are impressively aggressive. I love your curved wall. I am grateful to live so far away from the horror of walls of muddy water and damaged nuclear reactors. Hope you are happy with me mentioning you on today's post for Esther's Boring Garden Blog. Tx Esther, enjoyed your drawings today. It's always so hard to bridge the gap between the small beauties and trials of everyday life and the vast tragedies that sweep away lives in moments. What can we do, but count our blessings and give from them what we can? Haiti, Chili, New Zealand, Japan; tragedy upon tragedy. I too am glad for a garden, a little place of respite, but I am aware of how tenuous our hold upon the land and upon life itself is. I appreciate the new views of your garden. I look forward to seeing your roses! Hi Emma, have been enjoying your Spice Trail! Like you we really need the rain around PE as well. We had a little bit the other day and suddenly everything looks green again. If only it would keep on coming. I couldn't help thinking of your neighbors reaction if you painted his yard green one dark moonless night. Almost time to turn the tables, I'm looking forward to spring while you're getting ready for fall. Thank you for the garden tour. I love how each part of your garden has names. We had our own tsunami alert and I realized I would not be able to save my plants at all. They seem so insignificant though in comparison with the loss of our Japanese friends. I agree Diana, it's hard to attach too much importance to our own little patches in the face of so much violent upheaval all over the world. Still, I do love the roof shots - gives me a better idea of your neighborhood and esp your pond. Wish my ungardener was as good as yours, Diana. Love the pond in the restful shade of Plum creek and woodland. The names of your areas convey a garden instead of the current lingo of calling them 'rooms' as if they were just another extension of the house. Agree it seems almost irreverent to blog about our garden woes and triumphs in the context of Japan's devastation. I had to laugh at "When the Ungardener is Ungardening on the roof" - beautifully written! Your garden really stands out from the others in your neighbourhood! I enjoyed marching round your garden Diana. I am trying to imagine ten weeks without rain and finding it difficult to get my head round - ten days without is unusual here :) I think that Carrie has taken the words out of my mouth with regard to to the devastating events in Japan.